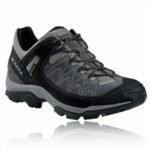 The first piece of kit that any keen hiker needs is the perfect pair of shoes. The question of how to choose your hiking boots can be a tricky one for some consumers that are new to the pastime because it is not about choosing something fashionable. There are some well-loved brands out there in the world of hiking boots but it’s there attention to detail on shape, materials and comfort that makes them so popular. 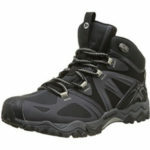 The first thing to look at when choosing hiking boots is the comfort: check the features and test them out. This is the most important aspect for any pair of hiking shoes because of the amount of time you will be spending wearing them. Naturally, the fit is an vital part of that so it is important to look at the required size when wearing walking sock and, if you have particularly wide or narrow feet, the special sizes that are available. 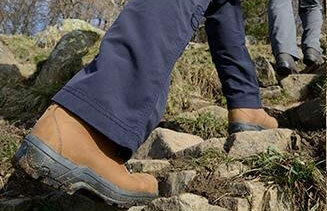 Comfort is provided from many different features – some boots will have many of them, some just a few. Padding around the tongue and ankle can be a matter of preference because some find them a bit restrictive but they can help with the cushioning. On that note, cushioning around the heel and within the insole are a must for on-going support and protection on those long walks across the moors and countryside. There are many styles to these insoles that are worth looking into further, some are quite simple and others have very high-tech gels and extras to increase the experience even further. 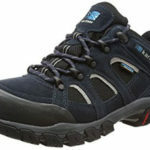 Another important comfort feature is the breathability because it is easy for feet to get hot and sweaty on these long treks, although the mesh lining and the placement of any holes could be problematic when considering the next factor. 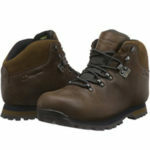 If you are going out hiking in tough terrains and in all weathers, you need a pair of boots that are up to the job. One of the first features that many buyers will want to try out when looking for the ideal pair of walking boots is the waterproofing and weatherproofing of the materials and linings. Many will say waterproof but the level of this varies from product to product; in some cases buyers can pretty much submerge their foot in a puddle on a rainy day and not suffer a soggy foot while others go walking through damp grass with their dogs in the morning and get wet. You can look at the materials used and the way they have been treated but the best way to check out their performance is to look at the testimonials of real users. Their reviews will not only point out the flaws of the materials – and the good points of course – but the potential flaws with other important aspects of the fit, cushioning and the traction. The traction of the tread is important because you don’t want to be slipping over on wet paths or on loose soils. The sole also has to be sturdy enough to deal with rough tracks and stones so be sure to look into the longevity of the boots – will they just last for a season or have buyers been wearing them for a number of years? The design of a shoe is much less important than the fit and performance because there is no point having the most beautiful design and colour scheme if it is no fun to trek in them and they make your feet hurt. There are plenty of interesting looking shoes out there in some beautiful colours but this should be the last step. Find the right brand with the right features for your needs as a hiker, then pick the colour option within that model that suits your needs best. Details like the laces can always be changed afterwards. Above all, be sensible with your priorities. There are many factors to think about when considering how to choose your hiking boots but the practical elements have to come first. Look at the shape and fit to see if they will suit your feet, take a closer look at the different comfort features that are offered and check out user reviews on their experiences with the comfort, weatherproofing and durability.